크로스 컨트리-주행에도 대응한 신개발 V-460바이 더를 장비하고 온 러-도에서의 라이딩에 필요한 높은 공력 성능, 벤치 레-)성능, 사용, 모든 점에서 타협 없는 추궁)길과 환경을 가리지 않는 스포츠-티인 주행을 가능한 스포츠 라이딩용 다목적 헬멧 "HORNET ADV" 그래픽 모델 "NAVIGATE" (나비이고 마트). 강인한 유리 섬유와 3차원 형상으로 한 유기 섬유 복합 적층 구조를 바탕으로, 높은 탄성 성능을 지닌 고성능 유기 섬유를 플러스, 경량이면서 강성 탄성이 뛰어난 고성능 셸 구조. 거듭되는 풍동 실험에서 얻은 데이타를 바탕으로 공력 성능, 기능성을 추구하는 완성된 HORNET ADV전용의 V-460바이 더-. 바이 더-에 요구되는 차양, 흙받이 등의 기능은 물론, 웨지 셰이프를 진화시키고, 바이 더-표면의 환기구가 차양의 효과를 해치지 않고 주행풍을 후방으로 싱크대, 바이 더-로 공기 저항을 저감, 더욱 효율적으로 에아잉테-구로 공기를 보낼 수 있습니다. 이에 의한 바이 더-에도 높은 공력 성능을 가지고, 라이더-에 대한 부담을 최소화합니다. 게다가성 표면뿐 아니라 기능 면도 추구. 빠른 리리-스스 쿠류의 도입으로, 바이 더-좌우 스크루우-는 90도 회전시키는 것에서 분리하는 것이 가능. 공구 없이 간단하고 쉽게 바이 더를 떼어 낼 수 있으며 시-르 도는 착탈도 순조롭게 실시할 수 있습니다. HORNET ADV전용으로 신규 개발된 CNS-2시-루도는 강인한 포리카- 보네 사이트를 소재로 한 인젝션 성형에 따른 높은 강성을 확보. 예금 인출에는 그동안 채용된 스크루우를 폐하다, CNS-1시이 루도베-스를 채용했습니다. 원 터치의 시이 루도 착탈이 가능하게 할 뿐 아니라, 스프링 기구에 의한 시-루도와 창문 고무를 밀착시키고, 밀폐성을 높였습니다. 시-루도 상부에는 리브를 마련하고, 시-루도의 강성을 높이고 시-루도 개폐 시 요지레을 억제합니다. 또, 시-루도의 곡률 간 연구하고 왜곡을 누른 깨끗한 시야를 실현했습니다. 비가 내리는 가운데, 저온, 라이더-진행 먼저는 때때로 어려운 환경이 기다리고 있습니다. 모든 컨디션 속, 시야를 확보하는 것은 라이더의 안전을 보다 확실합니다. PINLOCK®fog-free sheet에서 진화하고 방수 성능이 향상된 PINLOCK®EVO lens를 HORNET ADV는 표준 장비. PINLOCK®EVO lens가 시-루도의 흐림을 막기,님- 장면에서 라이딩을 보다 쾌적한 것으로 하겠습니다. 라이더-에 직접 영향을 주는 공력 성능을 추구하고, 잦은 굴 시설 검증, 실제 주행 시험을 거쳐서 HORNET ADV의 에어로 폼은 창출되었습니다. 후두부 스포이라-형상만 아니라, 웨지 셰이프 타입의 V-460바이 더-, 모자 형태와 바이 더-양쪽의 공력 성능을 진화시키고, 고속 주행시에도 높은 안정성을 발휘. 라이더의 피로를 최소화합니다. 또, 바이 더-, 시-루도 등 파-트리 점수가 많은 듀얼 스포츠 풀 페이스 모델에서 라이딩시의 균형도 라이더의 부담에 직접 관계하는 중요한 요소입니다. HORNET ADV는 공력 특성과 피팅을, 라이딩 시 경쾌감을 최대한 높이도록 설계되어 있습니다. 바이 더-중앙과 앞머리의 에아잉테-구보다, 주행풍을 효율적으로 헬멧 내부에 도입. 그리고 톱 에어 아웃렛과 애로 에어 아웃렛의 합계 7개소의 아웃렛호-르에서, 헬멧 속 열기를 배출함으로써, 라이딩을 더 시원하고 쾌적한 것으로 하겠습니다. 또, HORNET ADV는 노-즈카바을 폐하다, 입가의 공기의 흡수를 향상시키기 위해서, 노-즈 부분을 기존의 듀얼 스포츠 풀 페이스와 다른 디자인으로 하고 있습니다. 르와 에어 인테-구에서 입가로 공기를 넣고, 하-돈 라이딩 시 -.에서의 답답함을 경감하고, 또, 시-루도 안쪽에 공기를 유입시킴으로써 시-루도의 흐림도 막을 수 있습니다. 최적의 헬멧의 피팅은, 쾌적한 라이딩을 만들어 내는 중요한 요소입니다. HORNET ADV는 3D내장의 채용함으로써 불필요하게 인테리어에 두께나 고됨을 주는 것 없는 쾌적한 보는 기분과 적절한 호-루도감을 낳고 있습니다. 내장의 표면 천은, 높은 흡방 습성을 가진 소재, quup (큐-프) 를 땀 흡수가 요구되는 부분에 배치하고, 헬멧 착탈 때 피부와 부딪칠 부분에는 기모 소재를 배치하는 것으로, 기분 좋게 보는 기분과 착탈시의 쾌적성을 실현했습니다. *quup은 도레㈱의 등록 상표입니다. 만일 때, 라이더를 구호하는 제삼자에게 헬멧을 제거하라는 것은 매우 어려운 작업입니다. HORNET ADV는 지-크팟도에 전용의 탭을 장비하고 탭을 잡는 일로 지-크팟도을 헬멧에서 빼낼 수 있습니다. 볼을 홈-루도하는 지-크팟도을 떼어 냄으로써 쉽게,이고 구호 대상 라이더-에 대한 부담을 최소화하면서 헬멧을 떼어 낼 수 있습니다. *당사 웹사이트에 나열된 모든 SHOEI 제품은 일본에서만 사용하도록 설계되었습니다. 따라서 일본에 설정된 안전 기준에 근거, JIS 및 SNELL과 같은 산업 표준에 대해 인증을 받았습니다. * 일본 이외의 지역에서 헬멧을 사용하는 경우, 위험은 당신의 책임 입니다. 각 국가 및 지역에 설정된 규칙 및 규정을 따르십시오. * 우리 웹사이트에 있는 모든 SHOEI 헬멧은 일본 시장을 위해서만 제조됩니다. 따라서 해외에서 판매되는 다른 SHOEI 헬멧 모델과 크기를 비교할 때 주의하십시오. 크기 설명이 동일하지만, 실제 크기와 무게는 약간 다를 수 있습니다. * SHOEI 옵션 부품에도 적용됩니다. 모든 SHOEI 옵션 부품, 해외에서 판매되는 SHOEI 헬멧에 대한 적합성이 확인되지 않았습니다." 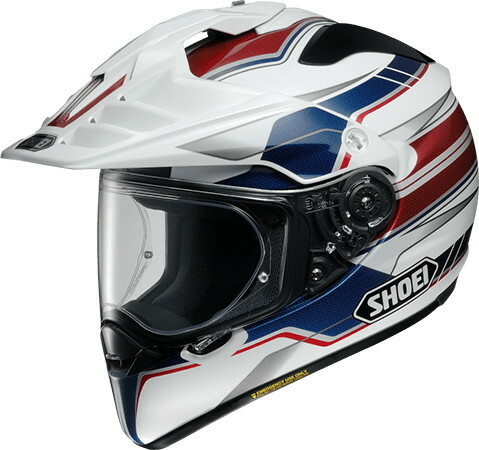 New category opened by SHOEI, SUH - Sport Utility Helmet "HORNET ADV"
Combining the power and functionality that enables cross-country driving, the beauty and comfort of running on road lightly, "Sporty run regardless of scene" The Sport Utility Helmet, which made it possible, HORNET ADV was born. Based on the concept of SUH, developed on the premise that it has sporty all-road performance regardless of road or environment. Newly developed for cross country driving The H-HORNET ADV is a multipurpose helmet for sports riding that has been pursued without compromising the V-460 visor and the high aerodynamic and ventilation performance required for on-road driving and the improvement in usability. Corresponds to CNS-1 Shield and CNS-2 Shield. Opening and closing of Shield and Face cover moves with Double action, crimping Shield to Eye Port. Prevent the intrusion of rain breeze, realize high quietness. In EQRS Teak Pad is equipped with Tab etc. to make this System even easier. Based on the data obtained from repeated wind tunnel experiments, we have evolved the wedge shape, as well as the sunshade and mudguard required for the V-460 visor and visor for HORNET ADV, which was completed in pursuit of aerodynamic performance and functionality. The vents on the visor surface allow the wind to flow backward without compromising the effect of the awning, reducing the air resistance from the visor, and it is possible to efficiently feed the air into the air intake. The aerodynamic performance is minimized to minimize the burden on the rider.In addition to the performance aspect, the functional aspect is also pursued. By introducing the quick release screw, the left and right visor screws can be removed by rotating 90 degrees By removing the visor simply and easily without tools, the shield can be attached and removed smoothly. VisorQuantity:Pair (for Left and Right) Rotate the Screw of 90-degrees to Left respectively and extract it. While pressing, pull out the Visor and complete. Newly developed for HORNET ADV CNS - 2 shield secures high rigidity by injection molding with strong polycarbonate as a material.The screws adopted so far are eliminated and the CNS - 1 shield base is adopted for installation In addition to making it possible to attach and detach the shield with one touch, the shield and the window rubber were brought into close contact with each other by the spring mechanism and the sealing property was enhanced.Ribs were provided on the upper part of the shield to increase the rigidity of the shield and In addition, we repeatedly studied the curvature of the shield and realized a clear vision that suppressed distortion. Compatible with PINLOCK® EVO lenses. CNS-2 PINLOCK® EVO lenses are approximately 37% more area compared to C-49 PINLOCK® fog-free sheets compatible with HORNET-DS. With the lens at the end of the shield, the Shield's large area is covered, and the Shield's wide area is covered. [Color] We will keep clear visibility. HORNET ADV's Eye Port is compatible with Goggles, assuming off-road driving, and Goggles can be worn even when the Shield is fully open. Sometimes a harsh environment awaits you in the rain, in the low temperature, where the Rider goes, sometimes a tough environment is awaiting.Securing visibility in every Condition makes the Rider's safety more reliable.PINLOCK® fog-free sheet, PINLOCK® EVO lens with improved anti-fog performance HORNET ADV Standard Equipment.PINLOCK® EVO lens prevents shield fogging and makes Riding more comfortable in various scenes. * Sample was placed in saturated steam at 50 degrees, the light was transmitted through the Laser Beam, and the time until the transmittance of the Laser Beam decreased to 80% from the initial state was measured. After pursuing aerodynamic performance that directly affects Rider, after verification at repeated wind tunnel facilities and testing on actual driving, HeroNET ADV's Aeroforme was created.In addition to the Spoiler shape at the back of the head, V-460Visor of WedgeShapeType By evolving the aerodynamic performance of both the cap body and the Visor, it demonstrates high stability even at high speeds, minimizing fatigue of the Rider. Also, Visor, Shield, etc. Parts In DualSportsFull faceMODEL with many points, the Balance at the time of Riding is also an important element directly related to the burden of Rider.HORNET ADV has aerodynamic characteristics and Fitting, the lightness feeling at the time of Riding being the maximum Large limit It is designed to increase. Contrast with our conventional MODELHORNET-DS.DRAG (Force pushed behind) 10%, LIFT (Power to rise) 4% improved aerodynamic performance. Introducing the running wind efficiently inside Helmet from VisorCenter and Air Intake in the forehead and discharging hot air inside Helmet from the total of seven Outlet Halls, Top air outlet and Neck Air outlet, Riding Make it cooler and more comfortable. In addition, HORNET ADV has made Nose part different from the conventional DualSports Full face in order to eliminate Nose cover and improve uptake of mouth air.Taking in air from LowerAir Intake to the mouth makes Hard Riding scene You can also reduce the breath in the shield and also prevent the fogging of the Shield by letting the air flow inside the Shield. The optimum Helmet Fitting is one of the Large cut elements that creates a comfortable Riding.The HORNET ADV adopts the 3D interior so that comfortable wearing comfort and appropriate Hold feeling without unnecessarily adding thickness and tightness to the interior are unnecessary The surface fabric of the interior is made of material with high hygroscopicity and moisture, quup (CUP) Placed in the area where absorption of sweat is sought, and by arranging brushed Material on the portion rubbed with the skin during attachment and detachment of the Helmet, comfortable wearing comfort and comfort at the time of detachment have been realized. For Center pad and Teak Pad surface fabric, Nylon Material made by Toray, which has twice the moisture absorbing performance of Nylon, quup (CUP) Adopting this Material all together in addition to contact cold sensation, while having a nimble feel, made comfortable when wearing higher. HORNET ADV adopts Ear Pad.Ear Pad is detachable and can adjust Space of ear.Punching processing is applied so that sound does not echo in Helmet even when Ear Pad is removed. Teak Pad uses Urethane pad with different hardness, prevents the load on temple by Glasses' Frame, designed to be comfortable Fitting even when wearing Glasses. * 이 사이트에서 판매 되는 헬멧은 일본 안전 표준을 기반으로합니다. 우리는 사고에 책임지지 않고, 손상, 상해, 또는 기타 관련 문제에 대해 책임을 지지 않습니다.